When it comes to teeth straightening in St. John’s, patients have more options than ever before. One of the most popular advancements in dental technology is the Invisalign® system. 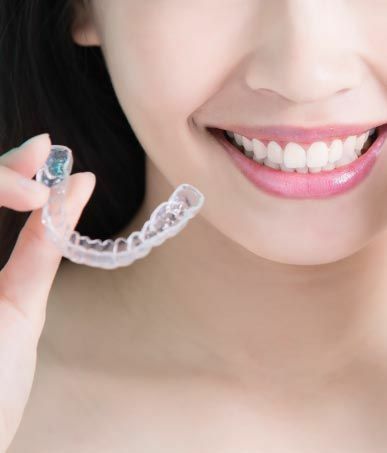 These clear, custom-fitted aligners are the ideal solution for anyone who may feel self-conscious wearing conventional metal braces. Invisalign® aligners are comfortable and easily removable which allows wearers to eat what they want while maintaining the ability to brush and floss their teeth with no impediments. Whether you have spacing issues or your teeth appear crooked, we encourage all patients to come in for a consultation to find out if the Invisalign® system is right for you. Properly positioned teeth support your jaw in a better way and contribute to healthier gums and better oral hygiene. If you’re curious to learn more about Invisalign®, we invite you to speak with us in person. Book an appointment at the Village Dental Office today. We’re always happy to accommodate new patients. Get in touch with our team today!